What do these people have in common? : Glenn Greenwald, Julian Assange, Jill Stein, David Sirota, Michael Flynn, Vladimir Putin. The answer, I would say, is that we don’t really know. That’s what is so disturbing. But first, let’s review who these people are. Julian Assange is the editor of Wikileaks. Like Greenwald, Assange did reasonable work on government secrecy back when Bush was president. 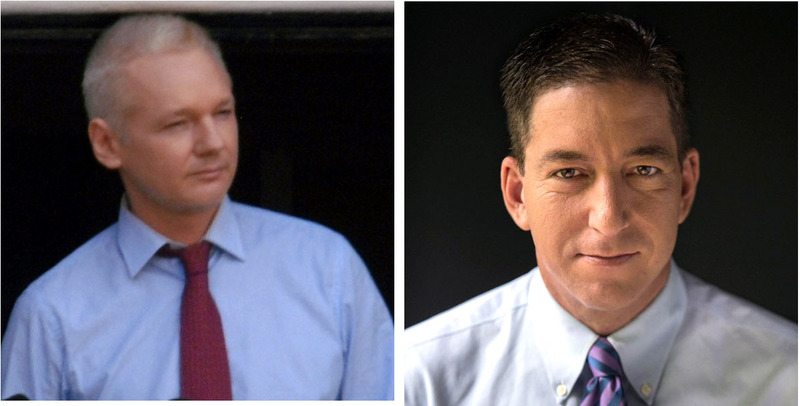 But, like Greenwald, it subsequently became clear that Assange had another agenda — a disguised agenda — and it wasn’t at all clear what that agenda was. Assange is still holed up in the Ecuadoran embassy in London. He is under investigation in the United States for his role in Russia’s attempt to undermine the 2016 election and elect Donald Trump. Jill Stein, a member of the Green Party, ran for president in the U.S. in 2012 and 2016. In 2016, she got 1,457,216 votes. In December 2015, she was photographed in Moscow at the head table of a dinner, with Vladimir Putin. Michael Flynn, a notorious American Republican, also was at the table. David Sirota is an American journalist — or should I say former journalist? — who recently went to work for the Bernie Sanders campaign. Before that, he had written, in The Atlantic, the Guardian, and other publications, hit pieces against other Democratic candidates for president, including and especially Beto O’Rourke. These publications have cut him off now, and, like Greenwald, no responsible publication will ever publish him again. Having mentioned Bernie Sanders, it might be good to remind ourselves that, though Sanders (a U.S. senator from Vermont) caucuses with the Democratic Party, he considers himself a democratic socialist. His party affiliation is not clear because, in Vermont, there is no party registration. Michael Flynn is a retired U.S. Army lieutenant general. He is a Republican. Briefly, he was national security adviser to Donald Trump. Two days after the 2016 election, in a meeting in the Oval Office, President Obama expressed to Donald Trump “profound concerns” about hiring Flynn. Flynn was charged with lying to the FBI about his interactions with the Russian ambassador. 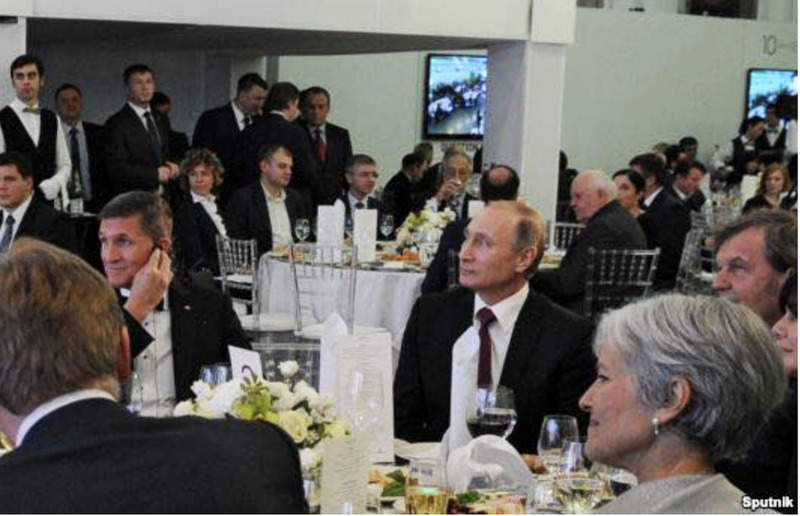 During a sentencing hearing last December with Judge Emmett G. Sullivan, Sullivan told Flynn that “arguably you sold your country out.” As I mentioned above, Flynn was photographed in Moscow with Vladimir Putin and Jill Stein. Vladimir Putin, of course, is the president of Russia. His career was in the KGB. He is an oligarch’s oligarch who takes great pains to hide his wealth and how he came by it. But some estimates are as high as $200 billion, which might make him the richest person on earth. Now let’s return to our question: What do these people have in common? Again, there is a great deal that we don’t know. But there are some things that we can say with high confidence. They all hate and have actively worked to damage the Democratic Party. With the exception of Sirota, they all have secretive or mysterious connections to Russia. They all have worked hard to influence American presidential elections, all of them by seeking to damage Democratic candidates, intentionally or unintentionally to the benefit of Republicans. The mystery here is what far leftists such as Jill Stein have in common with far-right actors such as Michael Flynn. Why would a leftist like Julian Assange work with Russia to elect Donald Trump and damage the Democratic Party? Why has the leftist Glenn Greenwald, who seems to like Russia better than his own country, been so busy this week saying that the investigation of Russia’s influence on the 2016 election is overblown? Why are so many right-wingers including Michael Flynn and Donald Trump so entangled with Russia? What is David Sirota’s real agenda, and is he, like Greenwald, Assange, and Stein, out to damage the United States by screwing with its politics? What does Sirota have in mind for Bernie Sanders’ campaign, and why would Sanders hire him? Where the right wing is concerned, we know what their interest in Russia is: money, and the empowerment of oligarchies over democracies. Where the far left is concerned, I can only speculate, because their agenda is disguised. My suspicion and working theory, though, is that theirs is a politics that demonizes the United States, that believes that reform is not possible, and that believes that the United States has too much power on the international stage. I strongly suspect that, as some die-hard supporters of Bernie Sanders have told me (they voted for Stein), they believe that the U.S. can’t be fixed without first tearing it apart. They scorn what they see as “incremental” reform. They saw Hillary Clinton as being as bad as, or worse than, Donald Trump. Having tried to remain reasonably objective up to this point, here’s what I really think. These people on the far left are damned fools, and their agenda is dangerous. Part of the danger is that the activities of the far left (and that includes Bernie Sanders) are going to make it very difficult to explain to the American people during the next year that the Democratic Party is not about far-left socialism. As in 2016, that puts us at risk of seeing an election thrown to the right with the deliberate assistance of the far left. Could Donald Trump have won the 2016 election (if he won it — I have my doubts) without the assistance of anti-American players such as Julian Assange, Jill Stein, and Vladimir Putin? It could happen again, because the far left is getting back into action, doing again what they did in 2016 — promoting a divisive politics, and trying to damage the Democratic Party while apologizing for, and actually working with, Russia. There really are people — including a few people I know — who believe that America can’t be fixed without tearing it apart first. I can’t imagine how they’ve convinced themselves that some kind of socialist utopia would emerge from the ashes of a failed American state. The opposite would happen. A corrupt, anti-democratic, Russia-like oligarchy would arise from the ashes of a failed American state. And that, of course, is what Russia and the meddling of oligarchs are trying to bring about, with the active help of some members of the Republican Party. Post-Trump, pro-oligarch anti-democratic Republicans are in control of the Republican Party. I am an active member of the Democratic Party. I will try to summarize my politics as a Democrat, because I think I’m pretty typical. The word “socialist” is going to be used as a bludgeon word in the 2020 election. I do not identify as a socialist. I identify as a Democrat, though I have no problem with the term “democratic socialism” if the term is properly defined and properly used. I am a socialist to the very same degree that Republican voters who love their Social Security and Medicare are socialists. But unlike Republicans, I want to extend and improve the social safety net to make the lives and health care of working people more secure. I want to accomplish that not with deficit spending but with much higher taxes on the rich, especially on income that is produced by playing with capital rather than producing anything. I am intrigued by the idea of a wealth tax, to start reversing extreme inequality in wealth and income, which is a threat not only to the social fabric but also to democracy. I want an end to the corruption that allows the rich to avoid taxes. I want a Green New Deal. I want immediate action on climate change, coordinated globally. I want a foreign policy based on diplomacy rather than vast military power. I want a foreign policy based on fairness and human welfare rather than oil and the profits of the rich. I want nuclear disarmament. I want religion out of government, and I would tax religion when it violates the contract of not meddling in government affairs. I want serious, rational regulation of corporations. I want serious, rational regulation of social media. I want a new, revised, re-thought version of a Fairness Doctrine that will stand in the way of Fox News acting as a privatized ministry of propaganda, so powerful that its pundits actually tell a foolish president what to say and what to do. I want corporate money out of politics. I want a criminal justice system that is fair and merciful to the little people and that doesn’t ignore the criminality of the rich. I want a politics that does not scapegoat all the people that white people and their white religion hate. I want fair elections, with no one’s vote suppressed. I want an objective system of legislative districting and an end to political and racial gerrymandering. I want new infrastructure, but with less emphasis on roads and automobiles. I want greenways and highway underpasses for animal migrations. I want more public land, public parks, public access, and nature preserves, not less. I want humane treatment of wild animals and farm animals. I want a lower-carbon agriculture aimed at reducing the consumption of meat and other unhealthy commodities and that keeps dangerous chemicals out of the food chain. I want our oceans cleaned up. I want affordable higher education at our public universities and some kind of amnesty on student debt, because our young people have been exploited to the point of enslavement. I want not just job training, but real education, education that brings back literature, languages, history, and music, and which doesn’t neglect science. I want the Democratic Party to figure out how to explain to people that no one likes abortion, but that Democrats don’t want to go back to a coat-hanger era in which we put women and doctors in prison. I want Democrats to be able to explain to Republicans that there’s a difference between a farmer’s shotgun and some damned fool’s arsenal of AK-47’s. To say that we can’t afford these things is a Republican lie. It’s a nation of untaxed billionaires that we can’t afford. To say that having these things makes government too big is a Republican lie. Tell that to the Finns or Danes, the happiest people on earth. My list may seem long. But public policy already addresses all these things, but badly. So, call me a Democrat, a democratic socialist, a leftist, a liberal … I’ll answer to all of those. You can even call me an incrementalist, if incremental improvements are all we can gain in our messed-up politics. But my politics and my hopes for America have nothing in common with anyone who thinks that you have to break America before you can fix America, or who thinks that our hope lies in Russia rather than in Washington. This was written by daltoni. Posted on Wednesday, March 27, 2019, at 6:06 am. Filed under Political issues. Bookmark the permalink. Follow comments here with the RSS feed. Trackbacks are closed, but you can post a comment.